Murder by Gaslight: Fire in the Swamp. 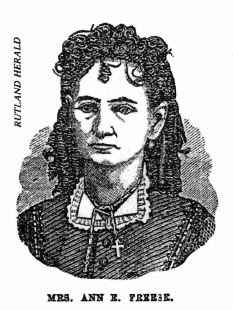 The morning of June 9, 1874 a two-story house burned to the ground in a section of Rutland, Vermont known as the “swamp.” Amid the rubble was the badly burned but recognizable corpse of Mrs. Ann E. Freese; she had been stabbed in the throat before the fire started. Finding her killer promised to be daunting since Mrs. Freese’s house was a well-known brothel with men coming and going at all hours. But circumstances quickly pointed to John Phair, a local ne’er-do-well whose relationship with Mrs. Freese was closer than that of a paying customer and who had conveniently left town the morning of the fire. Neighbors saw smoke coming from a second story window at around 6:45 a.m. Tuesday morning and sounded the fire alarm. They knew Mrs. Freese was inside but the front door was locked and the flames were soon too intense to try entering the house. By the time the fire department arrived it was too late to save the house or Mrs. Freese. As soon as possible, her charred remains were moved to a safe distance for examination. The arms and legs were completely burned away but the head and trunk remained. She was positively identified as Mrs. Ann E. Freese, 47 year old widow of Alvin Freese. Doctors and court officials quickly arrived for a post-mortem examination during which they proved that Mrs. Freese had been murdered. She had been deeply stabbed four times in the throat and was dead before the fire started. A razor was found near the body; it was thought it could be the murder weapon. It was known that Mrs. Freese kept a large amount of money in the house and had many pieces of expensive jewelry. No coins or jewelry were found and no melted metal so it was believed that robbery was the motive. Mrs. Freese had built the house three years earlier after the death of her husband. It was well known in the community that Mrs. Reese was operating a brothel from the house, sometimes in company with other women, sometimes alone. The number of anonymous men visiting Mrs. Freese made the search for her killer difficult. The search was complicated by the fact that Barnum’s circus had been in town that week and three employee fired by the circus became murder suspects. While rumors abounded, the police had no substantial leads. The selectmen of Rutland met and decided to offer a reward for $2,500 for the apprehension of the murderer. The Rutland police had one person of interest that they wished to question but could not find. John P. Phair was a known associate of Mrs. Freese, in fact they were seen at the circus together the previous Saturday. He had been staying at the Berwick House hotel but disappeared on Monday evening, the night before the murder, leaving his belongings behind. They learned he had boarded the train for Boston early Tuesday morning and they expected him to return the following day. Wednesday night the police traveled to Cuttingsville where they boarded the train from Boston, found Phair on board and arrested him. As a young boy John Phair seemed destined for a life of crime. He had been accused several times of pilfering around his hometown of Vergennes, Vermont. At age fourteen he dropped a large stone from a bridge which landed within an inch of the head Capt. Hall, a wealthy gentleman walking below. When he was eighteen, Phair was convicted of grand larceny and sentenced to six years at hard labor in Windsor Prison. He served four years and was then pardoned for good behavior. After his release Phair served in the Union Army, and after the war became a machinist. At the time of the murder Phair was twenty-eight years old and appeared to be walking the straight and narrow. Phair claimed that he had gone to Providence, Rhode Island, on Tuesday to look for work. He had only been in Boston long enough to change trains, and had done the same on the return trip. Policeman N. S. Stearn and Deputy J. C. Thornton (who would be referred to by Phair and his attorneys as “the reward-seekers”) travelled to Boston to see if any of Mrs. Freese’s belongings had been pawned there. They had a detailed description of her watch, down to the serial number engraved on the back, and they had descriptions of other articles she was known to have owned. They set out to visit each of the 280 pawnshops in Boston. At around the sixtieth shop, owned by Myer Abraham, they found Mrs. Freese’s watch and chain. Abraham had given $35 for the watch to a Mr. E. F. Smith of St. Albans, VT who was staying at the Adams House.He was shown a picture of John Phair who he recognized as the man who brought in the watch. Phair was also identified at the Adams House and at several other pawnshops where more of Mrs. Freese’s belongings were recovered. Abraham was brought back to Rutland where he identified John Phair in person. The handwriting on all of E. F. Smith’s signatures was matched to John Phair’s to everyone’s satisfaction. Phair was indicted for murder, arson and larceny and held without bail. The case against John Phair was entirely circumstantial but very compelling. It was fair to assume that person who pawned Mrs. Freeze’s jewelry was the person who killed her. John Phair was positively identified as the person who pawned the jewelry. In his instructions to the jury, the judge felt compelled to remind them that a man’s profession and religion had no bearing on reliability of his testimony. Verdict: Guilty, first degree murder. Exceptions were filed by the defense and the following January the Supreme Court for Rutland County heard the appeal. The exceptions were overruled and the petition was dismissed. John Phair was sentenced to hang on April 6, 1877. When it was clear to Phair that there were no options left to save his life he set out to write his “dying statement.” A few days before April 6, the statement was procured by Mr. E. C. Corrigan, a Boston reporter, under agreement that the statement be published in full, but not until the day after Phair’s execution. Corrigan then sold story to the Boston Daily Globe, with all of Phair’s conditions intact. On Thursday April 5, the editor of the Globe found out that an abstract of the statement had been obtained by the Associated Press for publication that evening. Since that would detract from the value of the Globe’s story the following day, they urged Phair to allow them to publish Friday morning. Phair finally agreed, confident that the story would not reach Rutland until after his hanging. The Globe published the story in Boston the day before the execution. In his lengthy statement, Phair continued to proclaim his innocence. He believed that he was still being treated unfairly because of his youthful crimes. The judge in the murder case was the same judge that had sentenced him to hard labor at eighteen. As his attorneys had, Phair blamed the reward-seekers, and the dishonesty of Jewish pawnbrokers. Regardless of what anyone said, he did not stop in Boston that day, he went on to Providence to look for work at the Providence Screw Company. Among the readers of Phair’s statement that morning was a Boston business man named M. D. Downing. Mr. 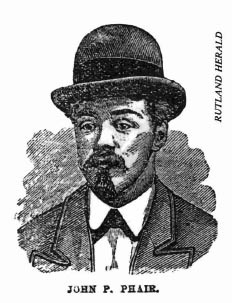 Downing had been in Providence on June 10, 1874, the same day that Phair claimed, and on his return trip Downing sat with a man who said he was a mechanic who had come from Rutland, Vermont, looking for work at a screw company. He did not remember the man’s name but believed it had to be Phair. Downing contacted the Boston Daily Globe, and they both telegraphed Vermont Governor Fairbanks. The hanging was scheduled for some time between 1:00 p.m. and 4:00pm and it was already noon. At 1:15 the Governor received the telegrams and immediately telegraphed the Sheriff of Windsor County with a reprieve postponing the execution for a week. The problem for Phair now was that by Vermont law he could not ask for a new trial if more than two years had passed since the original verdict. The governor granted him another reprieve until the first Friday of April, 1879 while the legislature debated changing the law. With much popular support, both houses of the legislature passed a law that said if two judges filed a petition after the statutory period, the matter would be referred to the Vermont Supreme Court. The petition was filed and on February 4, the Supreme Court took up the case. The court reviewed the new evidence along with the evidence from the original trial and all of the appeals and it looked as though Phair would get another chance. But when they rendered their decision on February 5, the Supreme Court let the original verdict stand. John Phair was hanged at the State Prison in Windsor, Vermont on April 10, 1879. He professed innocence to the end. Davidson, James, and Helen Davidson. "Rutland Murder Mystery." Rutland Historical Society Quarterly Oct. 1993: 4. Phair, John P. John P. Phair: A Complete History of Vermont's Celebrated Murder Case Containing a Report of The Trial and Conviction for The Murder of Ann E. Freeze, ... Statement; " Two Reprieves; Legislative. Boston: For the author, 1879.